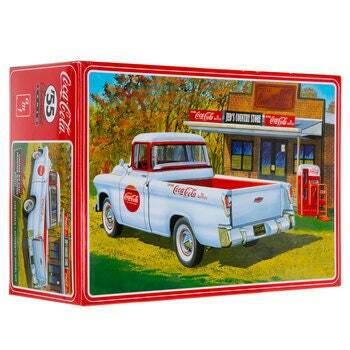 Build the vintage ride of your dreams with 1955 Chevrolet Cameo Pickup Coca-Cola Model Kit. This cute kit features the parts needed to build an old pickup truck with a flip-down tailgate, pad printed wide whitewall tires, a folding bench seat, and a Chevrolet 265 V-8 engine. Plus, it comes with a bonus die cast ending machine and dolly for an extra touch of bubbling antique charm!